From his first contact with the art of Tai Chi in 1972, Dennis has searched and studied both here and in China. His aim is to gain a greater understanding of the art, not only as a form, but how to use and relate its principles into daily life. He has studied and continues to study under many Coaches, Teachers and Masters in Australia and China. In June 1988, Dennis was graded to Instructor, and in 1992 he was graded to Senior Instructor. In April 1998 while training in China, his teacher, Master Gao Yen Tao, graded him to Master. This grading is registered in China. Dennis is a certified 4th Generation student of the Bu Di Zhen, Gao family. He is also 4th Generation Hong Chen under Master Peter Wu Shizeng. In October 1998, the first National Tai Chi Titles where held in Sydney called â€œThe Peaceful Challenge where he won Grand Champion, taking out 1st place in all his forms. In October he took 2nd place Grand Champion. At the 2000 competition Dennis was a Judge and in 2001, Head Judge. In November 2003 Dennis was elected president of the Tai Chi Association of Australia Inc. He has been the organiser/coordinator for the Tai Chi Association of Australia’s, T.C.A.A. Open Tai Chi Competition since 2003. He was Vice Chairman/Competition Organiser for the Australian Kung-fu Wu-shu Federation Qld Branch from 2004-2006. Dennis is currently the Australian Kung fu Wu-shu Federation National Competition Organiser. 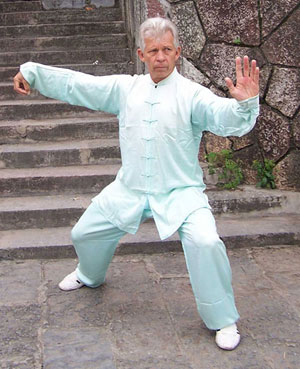 As well as teaching Tai Chi, Dennis is also a practitioner of Chinese Energy Massage, Oriental Massage, and Taoist Self-Massage Techniques. His experiences also include Voluntary service with Mirikai Gold Coast Drug Centre, Gold Coast Sport and Recreation Inc (Headway), and the 60 and Better Program. He has worked with the Twin Towns Stroke Support Group, Senior Community Resorts, and has held workshops with various Health and Family Support Groups, the Queensland Keep Fit Association, plus the corporate sector. He also held regular Wu-shu Workshops in Sydney at Dr Paul Lam’s January Workshops from 2001-2004. Dennis has been President of the Tai Chi Association of Australia Inc since 2003. Dennis is also a Government Accredited NCAS Level 1 Tai Chi Coach, and coach of the Junior, Open and Over 45s mens and womens Tai Chi Grand Champions at the AKWF National and Qld State Championships from 2004-2007.